Inspired by the luxurious look of Mediterranean properties, steel panel roofing installation in Windsor offers a superior product that is both lightweight and highly durable. As your roofing contractor in the area, we will ensure that attention to detail is paid to your property, providing the highest quality installation with the highest quality products. Though steel roof panels are more expensive than traditional shingles, substantial savings are seen within only a few years as it pertains to structural costs for new homes and developments, as well as in avoiding the splits, warps, and rots of traditional materials. The unique design of these materials reveals a weather-tight unit promising the less maintenance possible, ensuring that this roof installation is the last one you need. 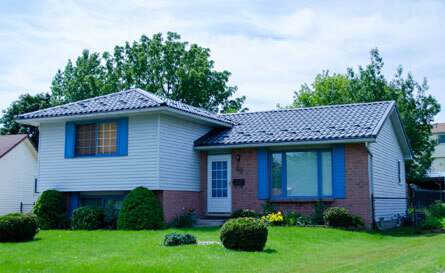 Generate curbside appeal and choose from our array of different colours and styles, putting together a steel roof in Windsor that is appropriate for your exterior and your surroundings. We advise anyone looking for a roofing contractor in Windsor to contact our roofing specialist at 519.322.6229, who would be happy to assist with any questions you may have.